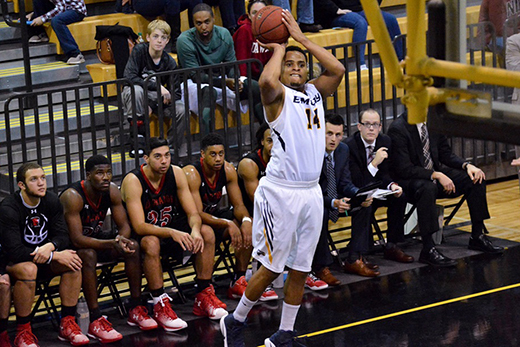 On Jan. 13, Emory basketball hosts its first "White Out" as the Eagles face off against Washington University (St. Louis). Wear white to cheer on the women's team at 6 p.m. and the men's team at 8 p.m. in the Woodruff PE Center. The new semester brings a variety of entertaining, educational and inexpensive events to Emory. January's calendar includes Emory basketball's first "White Out," the return of campus traditions such as Wonderful Wednesday and the Emory Farmers Market, plus several ways to honor the legacy of Martin Luther King Jr.
1. Get to know Canvas, Emory's new learning management system. Emory faculty can use Canvas, the university's new learning management system, or the old Blackboard system for courses offered this semester, but starting in the summer, course shells will be created only in Canvas. Luckily, the university's Canvas transition team is offering a full range of support if you need help making the switch, with 20 free classes scheduled for January alone, as well as a walk-in day on Friday, Jan. 6. Faculty and teaching assistants can visit Emory’s Canvas webpage to view the classes calendar or to schedule an individual appointment. 2. Shop for tasty treats as the Emory Farmers Market returns. Held on Tuesdays from 11 a.m. until 3 p.m. at the Cox Hall Bridge, the Emory Farmers Market returns from its winter break hiatus Jan. 10 with plenty of tasty treats, from local produce grown at the Oxford College Farm to a variety of other organic items. Pick up unique foods to cook, and also remember that many vendors offer prepared items so you can grab a quick, healthy lunch or snack. Many items are available for less than $10. 3. Root for the Eagles at Emory's first basketball "White Out." Basketball season is underway, and cheering on the home team makes for a fun afternoon or evening. All home games are free at the Woodruff PE Center, so it's easy to bring family or friends. This month, look for the special "White Out" games on Jan. 13, when the Eagles host Washington University (St. Louis). Wear white to cheer on the women's team at 6 p.m. and the men's team at 8 p.m. You can also catch the Eagles in action at home on Jan. 15 against the University of Chicago, with the men's game at noon and the women's game at 2 p.m.
4. Honor the legacy of the Rev. Dr. Martin Luther King Jr.
Martin Luther King Jr. Day — Monday, Jan. 16 — is a university holiday, but don't just take a day off. Instead, join Volunteer Emory for “Emory's Day On," and spend the day with local service organizations addressing a range of social justice and community issues. The full list of projects for this year is still being finalized, so watch for announcements of when to sign up. On Thursday, Jan. 12, the 2017 Emory Law MLK Day Lecture will be presented by Cornell Brooks, president and CEO of the NAACP. Brooks will discuss “Why We Can’t Wait: Civil Rights on the Eve of the Trump Inauguration" at 6:30 p.m. in Tull Auditorium of Gambrell Hall. RSVP is requested but not required. On Tuesday, Jan. 17, the Martin Luther King Jr. Holiday Observance at Emory features community organizer and artist Bree Newsome, who made headlines when she scaled the 30-foot flagpole in front of the South Carolina state capitol to remove the Confederate flag after nine people were killed in a racist hate crime at Emanuel African Methodist Episcopal Church in Charleston. The event is set for 4 p.m. in Winship Ballroom of the DUC. On Wednesday, Jan. 18, Oxford College hosts its annual Martin Luther King Jr. Celebration at 7:30 p.m. at Old Church. Rev. Avis Williams 78Ox 98C 08T, among the first African-American students to attend Oxford, is the featured speaker at the event, which also includes music from Voices of Praise gospel choir, Oxappella and the Newton County MLK Interdenominational Choir. 5. Enjoy Wonderful Wednesdays as the tradition kicks off the new semester. Don't miss Wonderful Wednesdays in Asbury Circle from 12:30 to 2:30 p.m., with a variety of special activities, give-aways and tables from student groups. After pausing for the winter break, the tradition resumes Jan. 18. This weekly community celebration harkens back to the time when Emory didn't have classes on Wednesdays; while those days are gone, student moderators work hard to make sure the event provides an entertaining break from the daily grind. 6. Celebrate innovative alumni at the Emory Entrepreneur Awards. Join the Emory Entrepreneur Network on Wednesday, Jan. 18, to celebrate the 2016 recipients of the Emory Entrepreneur Awards. The Emory community is invited to mix and mingle in WeWork Tower Place while learning about the 22 alumni awardees and their businesses, which span the creative, technology, finance, real estate and retail industries. The event, held from 6:30-8:30 p.m., costs $10 for current students; $15 for alumni who graduated 0-10 years ago; and $20 for other alumni. For more information or for faculty and staff tickets, email Sarah Rawls. 7. Hear beautiful music and support young singers at the Atlanta Community Choral Festival. For this annual festival, the Atlanta Master Chorale performs with high school students from outstanding chorale music programs in Atlanta. The free concert, with no tickets required, takes place on Saturday, Jan. 21, at 8 p.m. in Emerson Concert Hall of the Schwartz Center for Performing Arts. 8. Enjoy tea or stories at the Michael C. Carlos Museum. In addition to special exhibits and permanent collections, the Michael C. Carlos Museum hosts a variety of events throughout the year for audiences ranging from scholars to the general public and families with children. Noble Marbles Lecture: Thursday, Jan. 18, 7:30 p.m., Ackerman Hall. In the 18th century, James Stuart and Nicholas Revett were among the first adventurers to record Greek architecture, applying a relatively accurate archaeological approach to recording buildings known only by name in the West. Elizabeth Dowling, professor emeritus in Georgia Tech’s College of Design, discusses the work and influence of the pair in a free lecture titled "Stuart and Revett and the Antiquities of Athens." Artful Stories: Saturday, Jan. 21, 10 a.m. In the African gallery, children will hear "Lila and the Secret of Rain," the story of a Kenyan girl who saved her village, and learn about the vital importance of water in Africa. After looking closely at an incised Makonde clay vessel from Mozambique, children will make clay pinch pots in the studio. This free program is geared towards 3–5 year olds; reservations are required by contacting Alyson Vuley at 404-727-0519 or avuley@emory.edu. AntiquiTEA: Thursday, Jan. 26, 4 p.m., Ackerman Hall. Before painting and firing a vase, Athenian artists made sketches on the surface of the clay using wood or charcoal. Enjoy afternoon tea and scones as Julianne Cheng, graduate student in Emory’s Art History Department, discusses ways in which Reflectance Transmission Imaging (rti) has helped to uncover elaborate preliminary sketches on works by the late archaic Athenian cup-painter Onesimos in the Carlos collections. 9. Catch "Violamania!" at the Schwartz Center for Performing Arts. What’s better than one viola? Six violists performing everything from solos to all six together. Featured musicians for this free Jan. 28 concert include Yinzi Kong, Tania Clements, Allan Sandlin and others. Violamania! begins at 8 p.m. in Emerson Concert Hall. 10. Learn about race and difference as the James Weldon Johnson Institute's colloquium series resumes. The James Weldon Johnson Institute's Race and Difference Colloquium Series hosts its first speaker for the new semester on Monday, Jan. 30, at 12 p.m. in Woodruff Library's Jones Room. Carla Shedd, assistant professor of sociology and African American studies at Columbia University, presents "When Protection Becomes Punishment: Policing the Public (Schools) in an Unequal City," a talk examining how Chicago’s most vulnerable residents navigate their neighborhoods, assess their life chances and reconcile their encounters with the law.